uMonitor is a uTorrent client app for iPhone and iPod touch which lets you monitor your torrent files being downloaded through uTorrent on a Windows PC or a Mac. 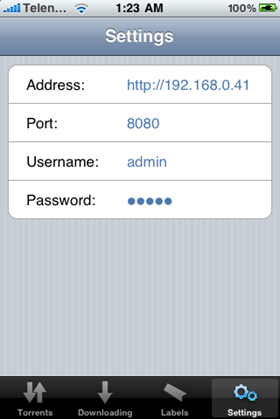 Add “http://repo.theiphonebay.org” to your Cydia repository. Search for “uMonitor” and install it. Now enable Web UI on the uTorrent client app installed on your computer (The picture above has been taken from uTorrent on Windows Home Server). Goto Preferences -> Advanced –> WebUI and enable the check for “Enable Web UI” option. Enter username and password of your choice and check the port for uTorrent. 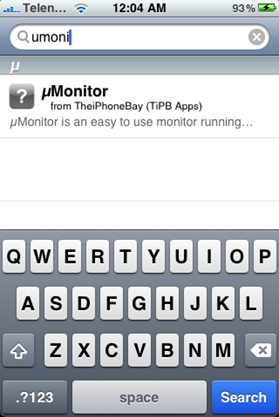 Now start the uMonitor app on iPhone. Goto Settings tab and enter the details that you set earlier in uTorrent’s Web UI option. 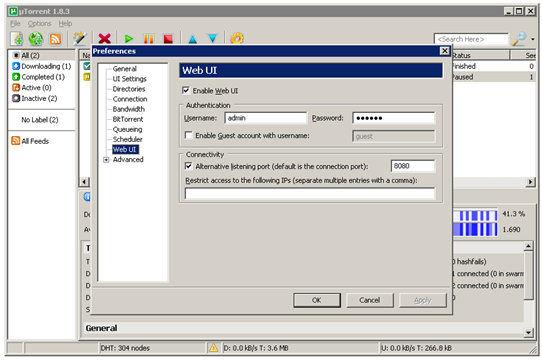 IP address is the address of the computer where uTorrent is installed. You can set this to your local network IP to access uTorrent locally, or the public private IP to access it from anywhere in the world. Thats it! you can now control all the files your computer is downloading right from your iPhone from anywhere in the world! The progress of files currently being downloaded on your computer. Option to give labels to your torrents. Detail of the file currently being downloaded. 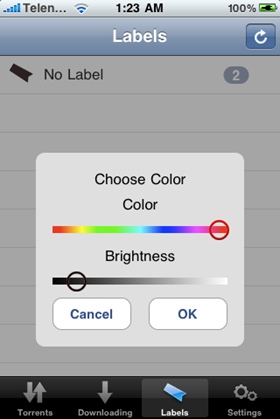 Start, Stop, Resume and delete any torrent file right from your iPhone from anywhere in the world! 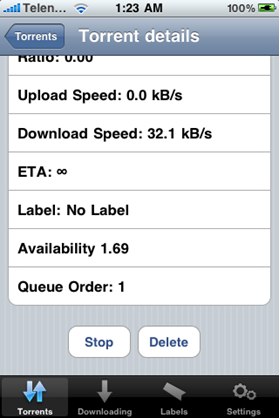 Alternatively, if you are not willing to jailbreak your iPhone then you can use iPhone Web Interface for uTorrent. Installation instructions for which can be found here. If you are looking for a torrent client app which can download torrent files on your iPhone, then I will recommend you to check our Torrentula – a BitTorrent client for iPhone and iPod Touch. Fantastic! Great post, really helpful. How do i find my IP of laptop. you on Windows or Mac? Sorry, im on windows 7. 1. Goto Network and Sharing Center. 2. Click on “Change adapter settings” option found in he left sidebar column. 3. Right-click on your connection (titled Local Area Connection if you're using an ethernet cable or Wireless Network Connection if you're on WiFi) and click Properties. The value in “IPv4 Address” row is your IP address. Hope this helps. It only works when i am inside my office network (192.168.1.x) but when i go outside (home or other place) and i put my no-ip (http://www.no-ip.org) adress on the umonitor i get a error msg that umonitor cant connect to the host, i have the port 8080 open on my firewall and the router pointing to my pc, i can access to my pc via remote desktop or http (i have apache) from any place on the world with my no-ip adress also with the Jaadu RDP app on my iphone, the problem is only with umonitor. How to make this work with uTorrent on Mac? The procedure is same for the Mac. Just setup the Web UI in uTorrent to get it working. I'm having the same problem with my dyndns address. I can connect remotely with rdp and numerous other hosted services, but the uMonitor client won't connect unless I'm on my home network. I believe this is due to not having the “http://” at the beginning of the URL you are connecting to. Either that or that field is still blank (which is the default). Are you able to connect from the internet to your home network with other utilities? You need to know your public IP (either static or through a dynamic DNS service) and then have the port mentioned in the settings for the webUI forwarded through your router/firewall to the PC running uTorrent. me 2 i have port 8080 open and enter my public ip in the settings tab.. but it doesn't connect. Why? it ony works on my home network through wifi.. is all you do change your computers ip address in the settings tab to your public ip address? leave every thing else the same? THIS DOESN’T WORK. SOURCE NOT FOUND.